We begin with a guided imagery meditation to connect our energy and to get everyone into a relaxed and tranquil mood. Everyone closes their eyes and I lead a meditation with new age music playing softly in the background. At the end of the meditation, I ask people to keep their eyes closed but to raise their hands to the center of the Circle, palms facing in, to completely connect our light and energy, and to send Reiki to whomever needs it. (Earlier, when people arrive, everyone makes a list of names of those who are in need of healing, and places these papers in a box that rests on a table in the center of the Circle.) We also send distant healing to Mother Earth as well. Then when we are done, we head upstairs to the healing space, where there are three Reiki tables set up. I most delight in people’s joyful reactions to their Reiki mini-sessions. Though these sessions are quite short (usually 12-15 minutes) recipients usually open their eyes, sit up and look completely rejuvenated and glowing afterwards. Some even have fascinating metaphysical experiences — seeing colors, or perceiving “angelic” presences, being transported to other dimensions and places. Others simply feel supremely peaceful, with a joyful sense of renewal. I believe everyone receives exactly what they need from their session. One lovely aspect of this gathering is that usually each Reiki recipient gets treated by anywhere from two to four Practitioners at one time. That makes for such a soothing, healing experience. Circles are a radiant gathering of like-minded individuals. This need for like-minded connections is so obvious in the minutes between sessions. As zen as the sessions are, in-between one hears the buzz of lively chatter as people share their table experiences as well as discuss a variety of topics. Sometimes it takes me an extra minute to get everyone quieted down and moving into our next round of sessions, as people get very happily caught up in the chatter. Though I often call this a Healing Circle — it is officially a Reiki share, meaning that it primarily consists of Practitioners giving sessions to each other. However, I make it clear on my website that ALL are welcome. Sometimes people with major physical ailments or conditions show up (they are not Reiki-trained) in need of healing. There are always one or more non-Practitioners that attend. Some are interested in learning Reiki and want to experience a short session first and find out more about the modality. Others are just curious as to what happens during a Healing Circle. Many of the attendees are “regulars” and consistently show up to most Circles. They have become my peers, my friends — and I so enjoy their positive energy and dedication to practicing Reiki in this group setting. If you ever have the opportunity to be part of a Reiki Circle, absolutely join in and have a wonderful, relaxing experience receiving Reiki from one or more Practitioners. And if you are local to where I live in Long Island, I hope to see you one day at one of my Circles! One of the most fundamental aspects of being an Animal Reiki practitioner is to be truly flexible with each session. After all, there are so many varied animals with which one can work and each session is so very unique. Even different sessions with the same animal can be totally varied. The most significant point I convey to my students is that it is wise to always begin with a hands-off approach. When I teach a class, there can be Level I students as well as Reiki Masters taking the course. I find that sometimes it is easier to work with newcomers to Reiki, who aren’t as set in their ways about having to place ones hands on the body for the healing to be effective. Most practitioners and Masters are very used to placing their hands directly on the areas needing healing in terms of human Reiki sessions. It is very contrary to their usual practice to have them get into the mind set of beginning with your hands off the animal, just sitting quietly nearby and letting the Reiki flow for the Highest Good. In a number of my classes, Masters and Teachers who have been mostly working with people might share stories of the few times they have worked with animals. Times they did not consider successful. Times when they were sure the animals were not really interested or receptive to the energy. And of course, each time they were forcing the animal to accept a hands-on treatment which was similar to a hands-on human treatment. So I am not in the least surprised that the animals were not particularly open to those treatments. Animals need to have the freedom to take as much or little (or none) of the energy as they like. They don’t like to be confined to being stuck between our hands. They like to have the flexibility of moving around. That doesn’t mean they are not open to receive Reiki. That just means they prefer to enjoy Reiki in a more flexible and free-spirited manner. That is why as Practitioners, we need to really just be very flexible with the way we offer a session. Maybe you will be seated on a chair near the animal. Maybe you will be seated on the floor. Maybe the animal will remain at the other end of the room. Or maybe they will come forward and maneuver themselves under your hands to show you exactly how they would like the treatment. The bottom line is that you have to be open-minded about the way the treatment will unfold and let go of those preconceived notions about having to place your hands on the animal in such and such way. The second part of this is that if there is another person (the animal’s owner) involved, you may have to very tactfully and professionally explain that you don’t have to touch the animal for the treatment to be effective. Energy knows no bounds and will travel between you and the animal. Sometimes I find that people are very limited in their understanding and it is challenging to explain that I always begin with a calm, hands-off approach, just sitting almost as if in a meditation. This “meditational state” involves and connects profoundly with their animal. I always invite my clients to sit nearby, be open to receive some of the Reiki that fills up the room, and to peacefully observe their animal’s behavior during the session. I speak to them before and after the session, but request that they remain quiet during the actual treatment. Working with animals is always an adventure and quite fulfilling as I love sharing Reiki with our animal companions. Tapping in to the radiant energy for the sake of a needy animal — and truly connecting with their pure and lively spirit is a beautiful experience. When we call upon the healing modality of Reiki and channel its beautiful energy, we are bringing in the flow of healing from a Higher Consciousness. So you can consider this from God, Source, the Divine, the Universe, whatever you personally perceive to be the origin of the Higher Consciousness. Everyone has a different and unique belief system. Reiki is definitely a practice that is spiritual in nature, yet it is by no means “religious.” And anyone, no matter what your religious background may be, can learn and embrace this healing system. 1) As it flows through a Practitioner, it does not deplete the Pracitioner’s own energy. As far as the first benefit, it provides this magnificent “win-win” situation for Practitioner and recipient. When you give a healing, you get a healing. In fact, the most effective sessions occur when you can simply let go of your ego, step back, relax and just let the soothing, radiant energy of Reiki simply course through you. And you will always get what you need as well — whether it be healing, tranquility or even being energized after your session. Of course, the same goes for the recipient or client laying on the Reiki table. They will get exactly what they need from a supportive, healing Universe. In terms of the second benefit, just know that Reiki will know wisely, exactly where to go to help the recipient/client. It is fine to set your healing intention at the beginning of the session. However, the bottom line is to be the open channel, that receptive conduit, and see what miracles might happen! And TRUST – trust that the outcome will be for the recipient’s Highest Good. I do believe that most people who have a Reiki session and/or become trained in the modality experience some form of what is termed a “healing reaction” or “cleansing reaction.” Have you personally ever felt this this? I have written about this numerous times, simply because it is a relatively common experience. Such a reaction is when the body, in preparation for thorough healing, releases any negative emotions, blockages, distortions that are hindering the health of the individual. These are all energetic in nature, not visible to the eye, and involve the energetic pathways of the physical, emotional (and spiritual) body. This can take a variety of forms including a tearful, emotional release; agitation; exhaustion; sleepiness; cold symptoms such as sniffles, congestion; digestive upsets; headaches; vivid or unusual night dreams and other various symptoms. Sometimes one has a very lengthy buildup of “stuff” (I will call it that for lack of a better term) that needs to be released before a healing environment can be created in ones body. This negativity or “toxicity” often needs to rise to the surface in preparation for release and clearing — and that is what can result in those difficult aforementioned list of symptoms. I do make clients and students aware of this potential process, without placing too much emphasis on it. For if I reel off a long list of “symptoms” then that could also offer a person a bit of a subconscious suggestion in terms of experiencing such a reaction. Some who experience a session for the first time just feel a glowing sense of peace and relaxation and get a beautiful healing without experiencing any obvious cleansing reaction. It is not a requirement for healing by any means. That doesn’t mean that a reaction doesn’t occur — it just means that there are not observable symptoms of one. One of the most common forms of “Reiki release” seems to be tears and very often at Healing Circles newer participants will have that kind of reaction. So I keep a box of tissues handy and encourage them to let the release just happen and not be embarrassed or upset by it. It is a natural process that in the end will result in a greater sense of harmony and healing within their whole being. If you should experience any of the above, please do take good care of yourself immediately following. Let the reaction run its course but be sure to stay hydrated with plenty of water, and partake of extra-healthy nutrition for that particular time period. A reaction could take hours, days — occasionally even a few weeks, though that is unlikely. You absolutely WILL feel better after the process is complete! It was June of last year and my partially-tamed feral cat, Grady, had experienced a puncture wound just under his tail, close to his rear end. I had noticed it and kept an eye on its progress of healing, doing Reiki for it when both time and cat permitted. At one point, it looked like it was healing, but then I would notice Grady biting and chewing on it, which could never be a good thing. However, for the most part, he seemed okay and continued to eat and act “normal” whatever that is for an outdoor cat. But one specific day, I heard an unhappy meow, and found him cowering under the bushes in the yard. I spoke to him and he seemed a little off, but then came out and appeared to perk up. Later that day, at dusk, I saw him slowly, painfully creep over the fence from the neighbor’s yard and he lay on a tree branch. I sat on the ground nearby, speaking softly to him and offering Reiki, which he accepted. There was a glazed, distant look in his eyes and as I felt the energy flow, I just knew in my heart that he was in bad shape. I suspected that if I didn’t get him immediate medical attention he would crawl off and die somewhere. So I asked Reiki to help me, surrendering to whatever I needed to do in order to be shown and guided in the best way to handle this. A bit later, I put out a bowl of fishy, smelly food but he really was not enticed. However, I kept moving closer to the house, all the while calling him by name. I left the back door open and then was incredibly relieved to have him come inside where I knew I would be able to catch him. My husband, prepping for a medical test the next day, was not a happy camper. 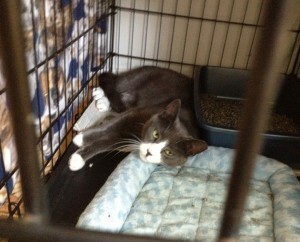 What unbelievably inconvenient timing to have to catch an injured feral cat! But I was determined to help my beloved little grey and white cat. His wound was bleeding and oozing, and he spent time hiding behind the sofa and under furniture. I lay on the sofa, letting the Reiki flow and finally he finally crept up onto the blanket on the sofa next to me. I knew in that instant I had to act — and quickly! I scruffed him at the neck, picked him up and quickly, but carefully lowered him into an open crate which I had stood up on its end so gravity would work with me. My husband wore protective gloves and helped make sure that Grady went into the crate with ease. Of course, the little feline was kicking and trying to scratch — and I did get one long scratch, but thank goodness that was all. So now I had to line up help for him for the next morning and that ended up being a local vet who works with the rescue that I volunteer for, Forgotten Friends of Long Island. The President of Forgotten Friends is an amazing lady and helped the vet work out care and a feral cat/rescue discount for veterinary services. Grady’s injury was very severe and the vet told me that he hoped he could save his tail, as it was in bad shape but he would do the best he could. I had no idea that Grady would be at the vet with drains and medication for three full days before I could bring him home and then he had to be confined to a crate in my living room for 17 days! Though originally the vet had used one of those huge e-collars with him, he was not eating at all with it on. So it was removed prior to me bringing him home. I offered Reiki to him nearly every day — which he seemed to be very accepting of. We somehow had this understanding that he would be patient being stuck in a crate for several weeks while he healed, but that when he was fully recovered, I would open the back door and release him to his preferred habitat. A number of people suggested that this time of being housebound would be a perfect opportunity to remake him into an indoor cat. But I knew in my own heart of hearts that he would not accept that. The best I could do would be influence him to be indoors on a more regular basis. Of one thing I am certain: Reiki absolutely helped Grady heal! And recover he did — a wonderful, full recovery to the point that now one would never have any clue that he had been injured as severely as he was and his tail looks plush and healthy. And as I had promised him, I opened the back door and he happily bounded out into the fresh air! Yes, Grady does spend more time indoors now — especially in the cold weather when he chooses to spend a full night curled up on the sofa, watching TV and snoozing the sound sleep of a joyful feline who knows that he is greatly loved — and that he can receive radiant Reiki energy whenever he likes! For a typical Reiki treatment, a client removes shoes only and then lays down on a Reiki table, which is similar to a massage table. The one-hour session may consist of 10-15 minutes of discussion with the remainder being table-time — the part where an individual deeply relaxes and is open to the healing benefits of the Reiki energy. However, the question arises — can Reiki be given anywhere? The answer is absolutely YES! The above session is the best-case scenario. But Reiki given “on the go” can be quite effective. If you are a Practitioner, let yourself be flexible and adaptable to each situation, however unique or unusual it may seem. I have given short Reiki sessions at busy health fairs where there is both noise and distraction. Each Reiki recipient sits in a chair, not laying on a table. I ask each to close their eyes, tune out their surroundings as best as possible, and just welcome whatever healing that Reiki will bring to them at that moment. Even with these brief sessions, people report benefits, relaxation, and lovely feelings of peacefulness. Of course, not everyone is going to be interested in trying Reiki. So as much as you may be excited about offering, do know that not everyone will take you up on the offer. But still, it is a radiant gift to reach out and suggest a brief session to someone who has not experienced the energy before. I have given on the spot healing at family and friends’ homes often enough. I have even given Reiki at a busy restaurant on one occasion for a friend whose back was hurting. It is such a beautiful healing connection when you can truly tune in to your animal on a soul level — or as close as possible to this. It is easier to do this if you can genuinely release the outcome of the Reiki session that you are offering. Magic is generally a busy, mischievous, joyful cat but he is very clear about when he would like some Reiki. and let the Universe do its amazing and beneficial “work.” Let Reiki flow through you for the Highest Good of the animal. Let yourself just be peaceful, a clear conduit. Let your Higher Self connect in with the Higher Self of your animal. It sounds simple, but is not always as easy as it sounds. Often there are distractions — sometimes external and sometimes internal. Sometimes your own head chatter can get in the way. Let yourself simply “be” one with the Reiki energy and then let yourself energetically connect with your animal. 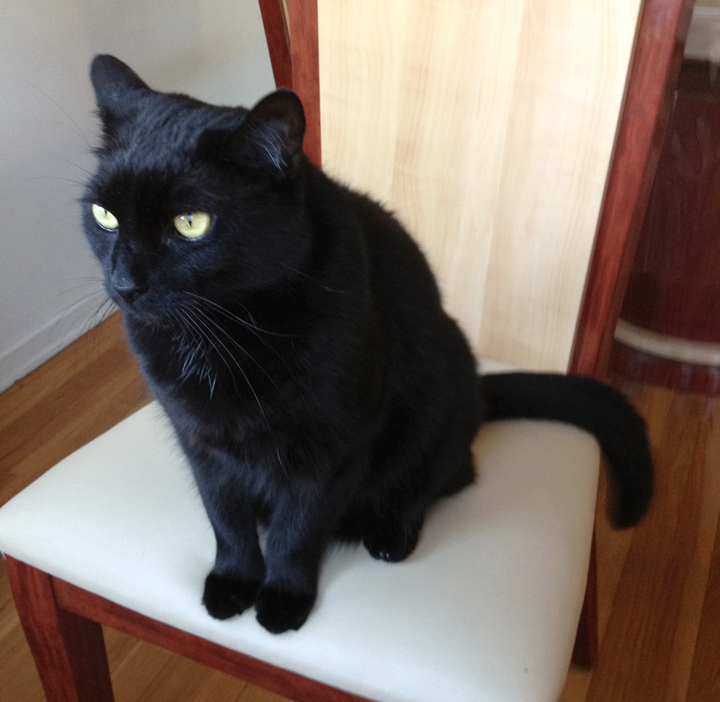 About a week ago I was offering Reiki to my own black cat, Magic, who had been quite sick after a prolonged boarding stay during the aftermath of Hurricane Sandy. He was on traditional medicine, but he was very open to Reiki. I was laying on my bed and he laid on my stomach, allowing me to touch him gently with Reiki hands. He soaked up the energy and then shifted his position. He inched forward to be closer to my face. He then placed one paw right over my heart and I felt him connect with me, getting the very clear message from him “I am one heart with your heart.” That profound communication actually surprised me and I was very touched and uplifted in that moment. That strong connection exemplified the closeness and bonding that Reiki can bring. And I’m sure Magic received much healing (as did I) at that moment. During a session, do your best to brush off distractions and to let yourself be right in the moment with your animal. Your animal will receive the healing that they need and you will receive the healing that you need! When Mikao Usui, the founder of the system of Reiki, sat up on Mt. Kurama in Japan in a meditational retreat — after 21 days, it is said that he was suddenly enlightened with the great Reiki energy. And this indeed was a life-changing event for him. Though no one is certain exactly what Usui’s intention was, it is believed that he was on a spiritual quest to improve his own life, as he was going through personal challenges. Many of us discover Reiki after experiencing our own personal challenges. I have found that to be a common theme with numerous practitioners — and yes, it was my own experience as well. Right now, many people are perceiving challenges as there is so much focus on change, shift, transformation — whatever you wish to consider it — particularly during this year of 2012. It is said to be the end of at 26,000 year Mayan Calendar cycle and a time of dramatic change. Maybe this is hype or maybe this is real. Nobody truly knows, but I definitely feel that there is some kind of awakening happening on this planet. And I do believe that Reiki Practitioners, as well as others who practice similar healing modalities — will be able to gracefully ride the wave of any change. We likely will be able to weather any energetic shifts in a more confident and adaptable way. And I can only hope that any shift will result in greater healing of our planet and peacefulness among all people. Reiki is in itself an awakening process. The Reiju (attunement) opens one’s energetic pathways to connect you with the Source of Reiki, thereby awakening your ability to bring in the flow of healing energy. Once you begin to interact with the energy and embrace self-healing, your own path to personal enlightenment may suddenly appear and open in front of you, and your remarkable journey will begin. Yet, be patient. Self-healing, an awareness of a Higher Consciousness, and a close connection to both “Divine wisdom” and the Reiki energy do not happen miraculously overnight (at least not for most people.) It is always a process, an unfolding. But if you embrace it, Reiki will definitely illuminate your path in a brilliant way. Know that timing is a major piece of this. When I was going through my despondent life period, I had a friend who was a Reiki Master. She was often trying to convince me in to have some healing sessions with her. Yet I never took her up on the offer as I was so closed off to anything but the challenges I had to deal with every day. I was focused on the turbulence that had overtaken my life (or that I had allowed to overtake my life.) In hindsight, I so wish I had embraced Reiki back then, because I’m sure it would have improved my situation, or at least the way I dealt with my situation. But I wasn’t ready yet. As time passed and my life course became a bit easier, I knew I was finally approaching that figurative “light at the end of the tunnel” — and that light was the healing glow of Reiki! Reiki opens doors and can let in a great breath of fresh air and exhilaration. It can set you on the road to a lovely spiritual adventure. It can bring you into a positive and friendly network of like-minded people who will resonate with your own beliefs and life path. It can enhance your personal journey by connecting you with other related aspects, such as other forms of holistic and natural healing, spiritual or metaphysical processes. But only what you are drawn to and what feels right for you. Reiki heals on every level, as the wisdom of the energy knows exactly what each individual needs for their own personal healing. And yes, I do believe it can help one become more aware, awakened, enlightened — more in tune with the knowledge and guidance of your soul calling, Higher Consciousness, or however you perceive your connection to spirit or the Universe. And overall, it can bring more of that pure, uplifting joy… that heartfelt happiness that comes from being in a place of harmony and at ease with the world. However, I personally consider myself a “healing facilitator” — a conduit for a lovely, radiant, soothing energy that emanates from the wise and profound Universe. I have had clients come to me with statements such as “So and so says my fifth chakra is blocked — can you clear it for me?” It takes some discussion to explain to a client that I am not an official “Chakra Clearer” — that I am simply a willing vessel for the flow of healing energy. I often use the expression “pure healer” in terms of letting the energy just flow in for the Highest Good of the recipient. • I do not diagnose blockages. I may do some intuitive scanning to see if any areas might do well with extra focus — but I don’t get stuck or consumed in seeking blockages. • I do not clear chakras. Perhaps the Universe does that — but I am not aware of exactly what the Universal Life Force Energy does during a Reiki session. • I do not get caught up in the negativity of any recipient. Meaning, I surround myself with the bright light of Reiki and do not believe that anything bad (byoki is the Japanese term for sickness) that is releasing from a client will attach itself to me. • I do not play psychic and try to connect to anyone’s deceased relatives or foretell their future. There have been some fascinating occurrences during sessions — and if interesting things happen, I note them silently. And deal with it tactfully if the client is having an experience. But my singular goal is to bring in a strong flow of Reiki for healing purposes, nothing else. • I DO trust that the wisdom of the energy will direct it to wherever it needs to go within the client. • I DO connect into to the bright, inner light that resides within each recipient — the healing light at the core of their being. I tune in to their energetic field and their heart center just so I can bring in that flow of healing specifically for them. I imagine that the Reiki that flows through me is awakening a strong positive response within them to begin to create a healing environment within their body. • I DO let myself relax, be in the moment, and be one with the Reiki energy. During any Reiki session it is essential to keep focused on your client or the recipient of the healing energy. However, with human clients, they are not apt to jump up and run away or nip you or go look for food during a session. When offering Reiki to animals, it can be a completely different story. That’s why an important aspect of working with an animal (particularly one who is not your own) is to really just BE in the moment with the animal. Peacefully and calmly in the moment. And yet, sometimes an Animal Reiki session is far from peaceful! Especially if there are several animals present and you are trying to concentrate on a particular one. Or if the animal you are working with is very hyper or anxious and may not settle into the treatment right away. So you need to really bring your consciousness to the present and pay attention to everything that is happening in the surrounding area. Is your animal clinging to it’s person? Or is it running around in play mode? Is it interested in you — or keeping its distance? You will need to connect with the animal — and make sure to “speak” with it and let he/she know that you are offering healing energy — something that is good and positive. Make sure you are in a calm, relaxed position and start the Reiki flowing for the Highest Good of the animal. Do pay close attention to your animal. When the energy is flowing, is the animal beginning to relax? Is it moving closer to you to investigate? Does it sit or lay down? Note all these things, but continue to just be very tranquil and grounded, all the while still connecting to the Reiki energy. And of course, just release the outcome and be open to accept whatever benefit the Reiki energy will bring forth. If the animal shows an interest in “hands-on” then by all means place your hand(s) gently on the animal. Let he/she be your guide. And just be in that healing space. Invite the energy to form a radiant Reiki bubble of light that surrounds both you and the animal. Above all, strive to be supremely peaceful — almost in a meditational space. Yet, at the same time, stay aware of your surroundings and remain tuned in to the animal. If you simply let Reiki do what it does so well — bringing in whatever healing is appropriate for the animal — then you may observe some amazing results. But do keep in mind that even if you don’t see anything miraculous happening at the moment, the healing can take several days to unfold. Trust that there is always a benefit! Sometimes it is more obvious than others, but it is always there.